Fernando Burstein, M.D., F.A.C.S, F.A.A.P. of Atlanta Plastic Surgery, P.C. recognized by his peers as a national ‘Top Doc’ in the field of Plastic Surgery for eight years in a row. Undergoing cosmetic or reconstructive plastic surgery can be an intensely personal and emotional experience, which is why I value the relationships that I have built with the men, women, and children that have come to see me over the years so highly. Double board-certified Atlanta plastic surgeon Dr. Fernando Burstein has been nationally recognized as a ‘Top Doc’ in the field of Plastic Surgery by Castle Connolly Medical Ltd., a leading national healthcare organization founded in 1991 to help guide consumers to the very best health care providers available. 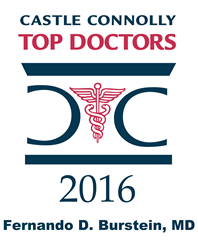 Dr. Burstein has earned the ‘Top Doc’ honor twelve times overall, in 1999, 2001, 2005, 2007, and in the last eight consecutive years since 2009. The Castle Connolly ‘Top Doc’ honor is different from many other awards in that the candidates are selected through a comprehensive, multi-stage process that begins with extensive peer-nominations. Licensed physicians from the local area and from across the country can vote for physicians in fifty-eight different medical specialties who not only excel in academic medicine and research but who also exhibit exceptional patient care. The nation’s best physicians are then identified from these nominees through a rigorous screening process conducted by an experienced, physician-led research team. A full list of the Atlanta-area physicians who have been honored as Castle Connolly ‘Top Docs’ can be found each year in the July issue of Atlanta Magazine. “Undergoing cosmetic or reconstructive plastic surgery can be an intensely personal and emotional experience, which is why I value the relationships that I have built with the men, women, and children that have come to see me over the years so highly,” Dr. Burstein noted. “Castle Connolly recognizes the importance of those relationships, and it is their dual emphasis on both the evaluations of medical professionals and the testimonials of actual patients that is, in my opinion, what makes this recognition such a privilege and a true honor.” Always a staunch advocate of patient education, Dr. Burstein maintains an informative facial plastic surgery blog and engages with his patients through social media, procedure videos, and his website. Many of his patients also highlight their personal experiences and satisfaction through his Spotlight Patient blogs. With board certifications in both plastic surgery and otolaryngology (head and neck surgery), Dr. Burstein performs a wide range of cosmetic and reconstructive facial plastic surgery procedures, ranging from facelifts and rhinoplasty to cleft lip and palate reconstruction in both children and adult patients. Since 1989 he has been a practicing partner with Atlanta Plastic Surgery, P.C., one of the most respected centers for plastic surgery in the Southeast and, as the Director of the Center for Craniofacial Disorders at Children’s Healthcare of Atlanta, has also helped to treat thousands pediatric patients suffering from congenital disorders. Over the course of the last twenty-five years, it has been Dr. Burstein’s philosophy that facial aging, while inevitable, can be managed through the gradual and skillful application of a combination of non-surgical and surgical cosmetic treatments. He has consistently achieved excellent results by beginning treatment plans earlier in the aging process using minor, minimally-invasive procedures, and then moving on to more extensive surgical techniques only as they become necessary later in life. This gradual approach, combined with his preference for using the patient’s own bone, cartilage, or tissue during surgery instead of synthetic material, maximizes the patient experience and provides the most natural-looking results. If you are interested in cosmetic or reconstructive surgery with an Atlanta ‘Top Doc’, contact Dr. Burstein’s office today at 404-256-1311 or visit his website to learn more about the procedures offered and view his facial plastic surgery results. Fernando D. Burstein, M.D., F.A.C.S., F.A.A.P has been an Atlanta-based plastic surgeon for more than twenty-five years. He maintains board-certification in both plastic surgery and otolaryngology (head and neck surgery) and specializes in cosmetic and reconstructive craniofacial surgery. He is a fellow of the American College of Surgeons and served as president of the American Academy of Pediatrics in 2006. Committed to continued education, Dr. Burstein is also a clinical professor of Plastic and Reconstructive Surgery at Emory University and has authored over 100 articles and book chapters. He is an active member of the American Society of Plastic Surgeons, the American Society for Aesthetic Plastic Surgery, and the American Society of Maxillofacial Surgeons. He is currently on the staff at both Northside Hospital and Children's Healthcare of Atlanta at Scottish Rite, where he is the director of the Center for Craniofacial Disorders. He has been recognized by NewsWeek, honored as a Top Doctor by Atlanta Magazine and Castle Connolly Medical Ltd. for the last eight consecutive years, and named to the National Best Plastic Surgeons list.